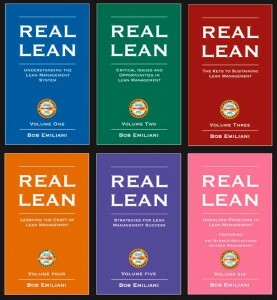 This is the back story to the six-volume REAL LEAN book series. Soon after updating and publishing the second edition of Better Thinking, Better Results, I embarked on a journey to answer the most important questions that people had about Lean management and Lean leadership. Over the years it became clear that these questions were not answered well or not answered at all. Through reading blogs every day, interacting with my readers, business leaders, and my students, the “voice of the customer” rang clear: they wanted to know more about several specific aspects of Lean. I wrote the REAL LEAN book series in response to customer demand for more information on these specific aspects of Lean. The different colored covers are a visual control to distinguish one volume from another. The books consist of short essays, thematically connected by the subtitle of the book, but otherwise function as stand-alone chapters. This allows busy people to pick up the book at any time and read a chapter, without having to relate it back to earlier reading. I limited the books to less than 200 pages (although Volume Six runs slightly longer, due to an extensive interview with Art Byrne), and printed them in a 5 by 8 inch format so the book would be small enough to fit in a briefcase or go on business trips. I have always sought to write differently compared to other Lean authors. The REAL LEAN series typifies the desire to be unique in the topics covered, perspectives offered, and quality of the research and analysis. This provides value to the reader because I am not saying the same things that everyone else says, in the same ways. My work is noticeably different and typically more informative because it offers broader perspectives due to my dual background as a hands-on Lean practitioner in industry and as a historian of Lean management. The tone of the books can be tough at times (though appropriate for the intended audience, managers, because people’s lives and livelihoods are at stake), but it is both fair and accurate, and they offer an abundance of practical, specific, and actionable guidance. Volume One, Understanding the Lean Management System, addresses common misunderstandings that people have about Lean management and Lean leadership. Volume Two, Critical Issues and Opportunities in Lean Management, addresses repetitive mistakes that people make, which, if eliminated, would improve their Lean practice. Volume Three, The Keys to Sustaining Lean Management, addresses people’s desire to know how to sustain Lean efforts, and offers insights and practical actions for doing that. Volume Four, Learning the Craft of Lean Management, corrects people’s practice of Lean by comparing it to learning a craft. Volume Five Strategies for Lean Management Success, describes how leaders can achieve greater success in their practice of Lean management. Volume Six, Unsolved Problems in Lean Management, describes problems that have been around for a long time and that still need to be addressed. I had a great time writing these books, and I am particularly proud of the chapters that make the connection between processes, behaviors, and information flow. I hope that sharing what I have learned about Lean management and Lean leadership will help you in your Lean journey. If you want to read a condensed summary of the REAL LEAN book series, read Moving Forward Faster.